Exhale and stash the umbrella for a day. Do not get too comfortable drying out though; rain is coming right back into town for Friday and the weekend. Today and Tonight: Expect a break from rain with some cooler temperatures on Thursday. As northerly winds of 5-10mph continue, high temperatures will struggle to reach 60 degrees. Some more sun is expected north of I-12 and into southwest Mississippi, with mainly cloudy skies persisting for coastal areas south of I-10. With the snap of a finger, winds shift again, clouds advance into the region and lows stop around 50 degrees overnight. 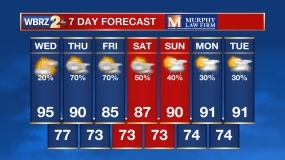 Up Next: Unsettled weather will return on Friday. Clouds will race back into the region with showers even possible for the final day of the week. Unfortunately, for a busy carnival season weekend of events, off and on rain is expected. While rainfall amounts look manageable, there could be some steadier, heavier pockets of activity. All told, up to 2 inches are the current forecast for the three-day stretch. Despite passage of a cold front on Sunday, an unsettled pattern will persist into next week with showers currently in the forecast for Mardi Gras. As a trough digs into the western United States, deep southwest flow will develop on Friday, quickly returning deeper moisture, therefore clouds and even showers to the forecast area. At this time, rounds of positive vorticity advection moving through that large scale southwest flow are expected to produce batches of rain across the forecast area as that general jet stream setup persists. Late Friday to at least late Sunday will be a wet stretch with off and on periods of rain. Forecast model rain amounts are not too aggressive, but two inches or so is certainly on the table at this point. A cold front will drive through the area on Sunday. This could provide a short break in the widespread rain activity, but overall, the unsettled pattern is expected to persist well into next week. 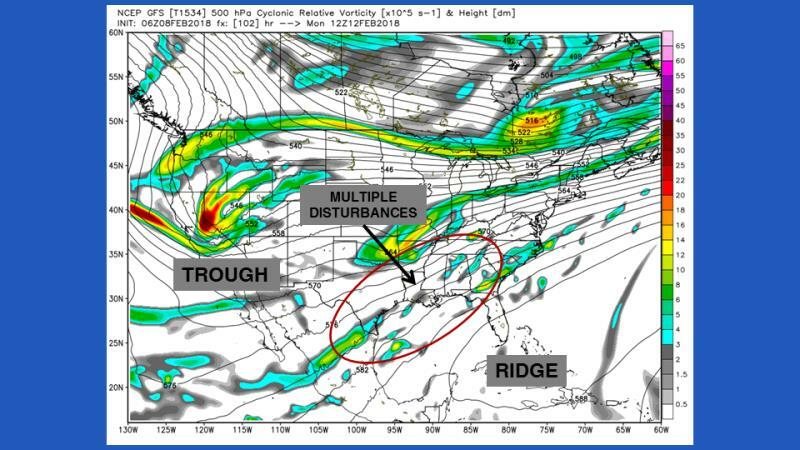 The western U.S. trough will not budge. Meanwhile, a ridge in the southwest Atlantic will then cause the central Gulf Coast to be locked into a deep southwest jet stream flow. As impulses of energy ride through that region, some pockets of showers and thunderstorms will be triggered. On the other hand, due to the ridge nudging into the Gulf of Mexico, warmer than average temperatures are also expected next week. Several days could bring highs into the 70s.